Cultural sea change is nothing new to the Bay Area of San Francisco, and the city that spawned the beats and psychedelia now finds itself a few degrees north of the technology revolution's epicenter. But is there room for art in the no-nonsense commercialism of the tech world, where everybody has a business plan? Rebeca Bollinger, a San Francisco artist who uses personal Web pages in her work, says she is "equally disgusted with and passionately seduced by" technology. The answer, it turns out, is yes, with a twist. A number of Bay Area artists are taking the technology that is transforming the area and making art with and about it. Several factors make the Bay Area a fertile region for technology-related art. Artists there are surrounded by technology as dot-com companies take over industrial neighborhoods that were once artists' haunts. Splashy Internet advertising plasters billboards and dominates radio spots. There are also last year's products, discarded by the tech industry but still useful to artists, as is technological know-how. "Technology is in the atmosphere here," said Jim Campbell, a San Francisco-based technology artist. Mr. Campbell, who works in Silicon Valley as a hardware engineer three days a week, said that the Bay Area creates an environment in which technology and art feed off each other. He is working on a piece that explores compression technology and the impact it has on information and meaning -- because, he said, "I've been working with compression in my job, making 40 or 50 pixels represent something." Ken Goldberg, a technology artist who is also an engineering professor at the University of California at Berkeley, said there was no question that the technology revolution was making itself felt in art circles. "In some way," he said, "all artists in the Bay Area are directly or indirectly responding to technology because it is so pervasive here." Nonetheless, art and technology often have an uneasy relationship. Rebeca Bollinger, a San Francisco artist who uses the Internet in much of her work, said she was "equally disgusted with and passionately seduced by" technology. "I try hard to be on the outside of what's going on in the industry," she said. "I get so sick and tired of all the technology propaganda. I'm sick of all the marketing. "We're so immersed in the economy of it. If you go to other parts of the country, you see that it's totally different. But what's happening here will happen there, eventually. We're living in this strange space of present-future." In some cases, companies and organizations in the high-tech field have embraced -- and financed -- existing art groups. Survival Research Laboratories, for instance, a prominent feature of the alternative Bay Area landscape since Mark Pauline founded it in 1978, builds large robots and creates violent spectacles where machines wreak destruction on one another. More recently, the group integrated the Internet into its art, connecting laptops to the robots and allowing remote Internet users to aim and fire powerful machinery during shows. "Probably since 1992 all of our shows have been affiliated with organizations related to technology," said Mr. Pauline, who has created events for clients like the publisher Miller Freeman, Wired magazine and Webzine99, a San Francisco conference for Internet-based alternative magazines. But while the booming economy has brought in money that has benefited artists, it could also impose restraints. Eric Paulos, director of the Experimental Interaction Unit, an art group, pointed out that being employed in the technology sector could limit artistic freedom, especially if an artist's projects are critical of technology. Every other Thursday, arts@large reports on the intersection of technology and the arts, including Web-based art exhibits, interactive music, hypertext fiction and other expressions of digital creativity. "It's hard to do anything too controversial if you're at a dot-com," he said. "This is an incredible time because you can do creative expression -- design work -- and get paid. But if what you're doing is driven by money, you're not really in control." Mr. Paulos said he made a point of distancing his work -- which includes a vending machine that sells a mock lethal pathogen and tracks users' identities -- from his role as a graduate student at Berkeley's computer science department to maintain his artistic autonomy. Ray Thomas, on the other hand, is firmly in the anti-tech camp. A spokesman for RTMark, a kind of cyberguerrilla group known for lampooning politicians and making mischief for corporations, Mr. Thomas pointed to escalating rents as a death knell for art. "Silicon Valley has basically destroyed the art scene in the Bay Area by bringing in so much money and so many people," he said. Many of his artist friends are moving to cities like Los Angeles, where rents are lower. "It's basically so demoralizing, people don't even have energy to make art about it," Mr. Thomas said. In a few cases, technology companies are looking to artists for new ideas that could lead to the development of new technology. 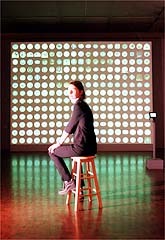 Corporate research centers like the Interval Research Corporation and the Xerox Palo Alto Research Center are financing artists in residence. Michael Naimark, an artist at Interval, said: "It's a funny situation right now, because there really isn't an N.E.A. to support experimental work, and there's so much money and activity in high technology. The question is, how do artists fit in? Nobody really has the answer." They do appear to fit in better in the Bay Area than down the road in Silicon Valley itself, which is generally acknowledged as not having much of an art scene (although a foundation for art and technology in the Valley is in the works). When asked about art in Silicon Valley, John Weber, a curator at the San Francisco Museum of Modern Art, said: "In Silicon Valley? They work. That's all they do. When they get interested in art, they move."